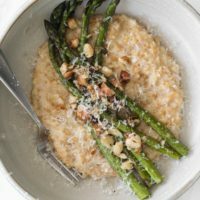 Einkorn Risotto with Roasted Asparagus | Naturally. I try and use as few pans as possible when I cook. So when I was writing out this recipe, I realized I dirtied a lot for this einkorn risotto. But, it’s worth it for a delicious spring dinner. There’s nothing better than roasted asparagus during the spring months. Pair that with the warming einkorn base- it’s a winning dinner situation. One note about making whole grain risottos. I love the result I get when I crack the grains. It doesn’t take long but the extra step provides a bit of flour to help thicken the risotto and make it extra creamy without a ton of cheese. 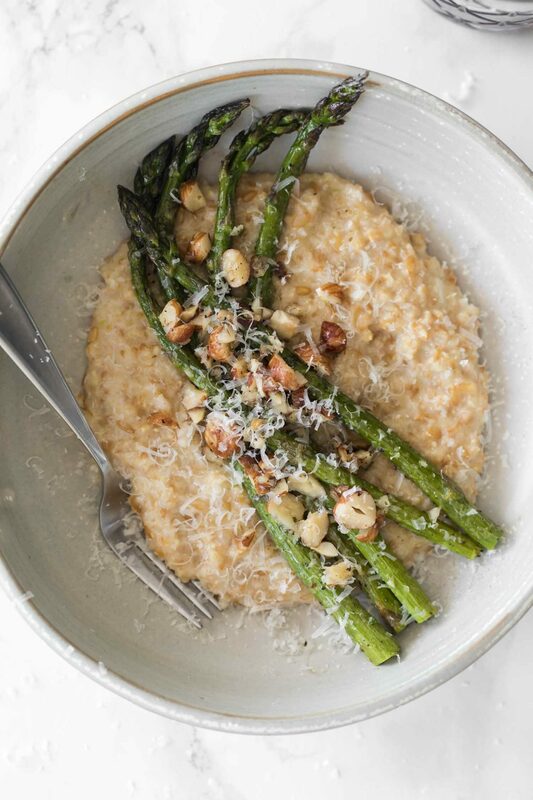 A perfect spring recipe featuring creamy einkorn risotto topped with roasted asparagus tossed with tarragon, butter, and hazelnuts. Crack the einkorn in a blender or food processor. ¾ of the pieces should be cracked with a bit of dust/flour as well (4 to 5 pulses). Combine the garlic with the vegetable broth and water in a pot. Bring to a boil, reduce to a simmer, and keep warm while making the risotto. While the einkorn is cooking, heat your oven to 425˚F. Trim the ends from the asparagus and place on a sheet tray. Toss with the olive oil and salt. Roast until tender but still has a bit of crispness to it, 10 to 12 minutes. Toast the hazelnuts in a small skillet over medium heat for a few minutes. Remove from the skillet and set aside. Add the butter to the skillet, melt and add the tarragon. Remove from heat. Once the asparagus is done, toss with the tarragon butter and toasted hazelnuts. Taste and add more salt if desired. Divide the risotto into two bowls and top with the asparagus. Scrap any loose butter and/or hazelnuts over the asparagus. Serve with a sprinkle of parmesan. 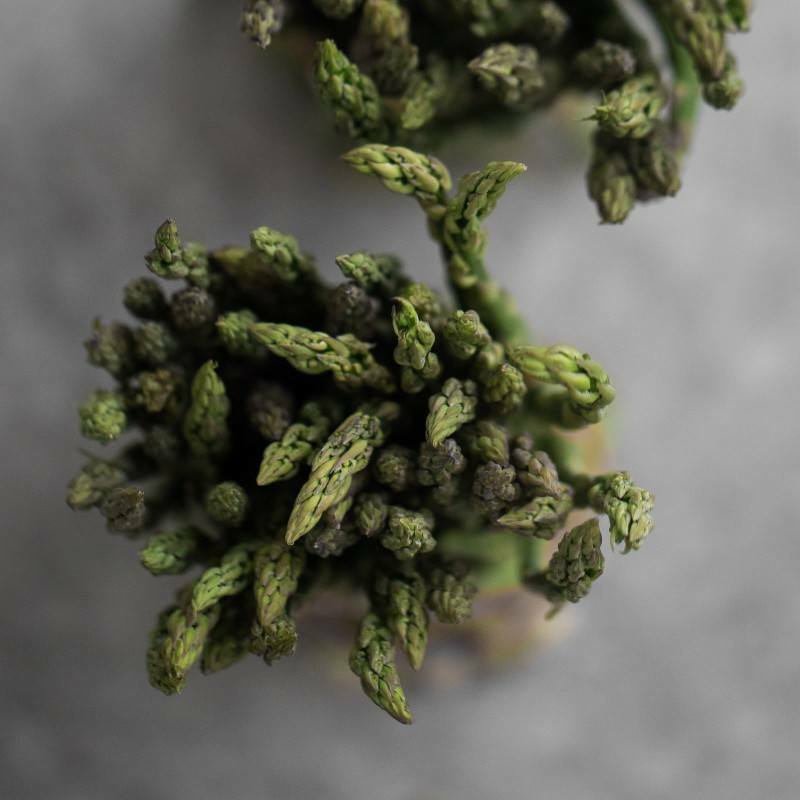 Tips + Tricks: Look for the younger/smaller asparagus. I find it works a bit better with the risotto dish. Toppings: This einkorn risotto is also delicious with garlicky greens, roasted turnips, or roasted radishes. Grains: Cracking grains for risotto also works great with emmer, wheat, spelt, or barley. Vegan: Make this vegan by mixing in about 1/2 cup white bean puree and a couple teaspoons of nutritional yeast in place of the parmesan and using olive oil in place of the butter.